It’s Christmas week, cookies have been baked, presents wrapped and have now been shipped and I’m humming along to some of my favorite holiday music playing in the background; I’ve also enjoyed a few Peppermint Mocha lattes and have sipped some eggnog . . . ok, so I’ve sipped more than a few eggnogs this holiday season . . . I thought it might be fun to have a super short giveaway for some of my favorite cookbooks I’ve picked up this year. Without further ado . . .
What can I say except that I heart Shauna, Danny and Lu big. 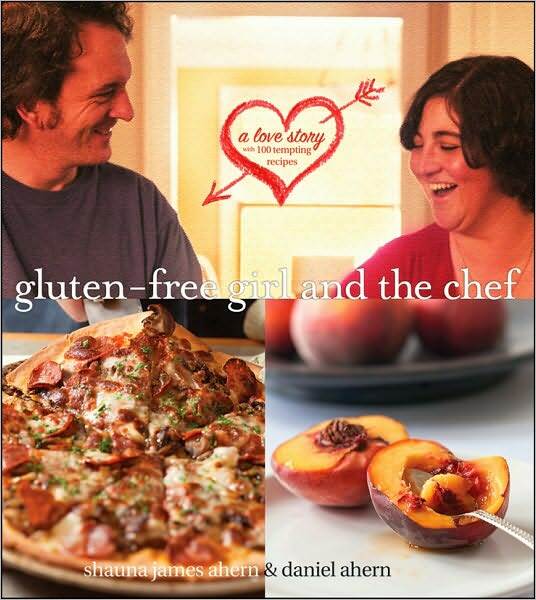 I admire Shauna’s passion for what she does, I appreciate that she shares ‘Lu’ stories with us via Twitter as well as on her blog and I love this cookbook; not only because I have a sister who has Celiac, but the cookbook is also a love story – and lemme just tell you, I’m a sucker for a good love story! The recipes are fabulous, straight-forward and not gimmicky in the least – just real, honest-to-goodness food that will knock your socks off and everyone will enjoy – celiac or not! Good to the Grain has received so many accolades it’s hard to know where to start. It’s been listed as one of the top cookbooks of the year by several of the media outlets and I can absolutely understand why. The photos, the recipes, the design layout – stunning! And the book teaches – at least has opened my eyes as to what’s possible when baking with various whole grain flours and not limiting myself to all-purpose. 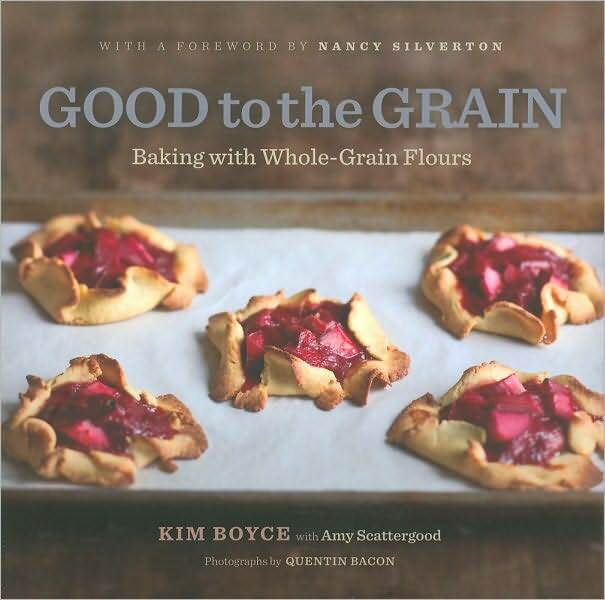 Maple Pecan Granola, Strawberry Barley Scones, Cheddar Biscuits, Spelt Pie Dough – every recipe keeps you turning page after page saying, ‘Oh, I want to bake that!’ Toss me into the ring of those who just can’t say enough good things about this book! I first met Abby Dodge last summer during Big Summer Potluck, hosted by Three Many Cooks and Ivory Hut; at the time I had no idea who Abby was . . . until she stepped up front and began demonstrating how to make one of the desserts from her new cookbook, Desserts 4 Today . . . and I have been a huge Abby fan ever since! Look, I am not a baker, not a real baker – but armed with this book, Abby makes me feel like I am – like I can conquer the baking world . . . ok, so maybe that is stretching the truth a bit. But Desserts 4 Today allows me to create stunning desserts that only use 4 ingredients and no one misses the other 15 ingredients other recipes call for – I am telling the truth here, girl scouts honor! This dessert book is a real life saver, real time saver and a real gem. The Nutella Brownies alone are legendary on Twitter! 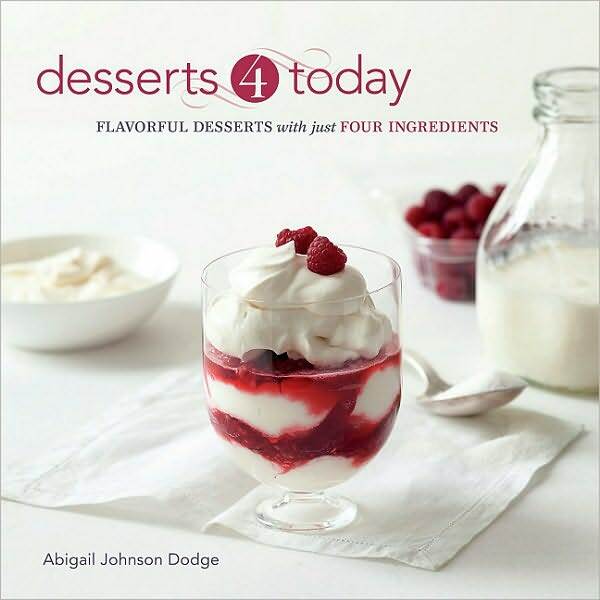 Simple, Sophisticated and Satisfying – 125 recipes, each with just 4 ingredients – that is Desserts 4 Today! 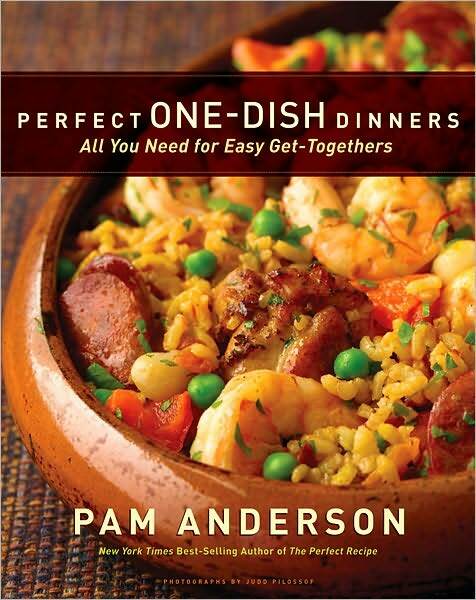 Perfect One Dish Dinners is the newest cookbook from bestselling author and USA Weekend food columnist Pam Anderson who is also one-third of the talent behind the uber chic and fun blog, Three Many Cooks. The book is presented in such a way that the focus is on one component of a meal – but Pam also gives suggestions (and sometimes recipes) for appetizers, salads, desserts – even wine pairings . . . can you say brilliant?! I’ll just say ‘thank you’ for one of the most used cookbooks on my shelf: Caesar Salad Flatbread Pizzas, One-Pot Penne with Spinach-Feta Balls, Spicy Chicken Enchiladas Verde and this appetizer which literally took me less than 20 minutes to prepare – these are just some of the fabulous dishes we’ve made from this book! FOUR random winners will be chosen from all the comments and each winner will receive ONE cookbook; all you need to do to enter is leave me a comment as to which book you’d like if you win (doesn’t guarantee you’ll receive your book of choice – but will do my best to accomodate). Giveaway is open to US residents only. Comments will be closed at 11:59PM EST on Wednesday, December 22nd; winners will be announced Thursday morning – Good Luck! KEEPIN’ IT REAL: I have personally purchased a copy of each of these cookbooks for the purpose of this giveaway at my own expense and have not received any compensation for any review or recommendations! 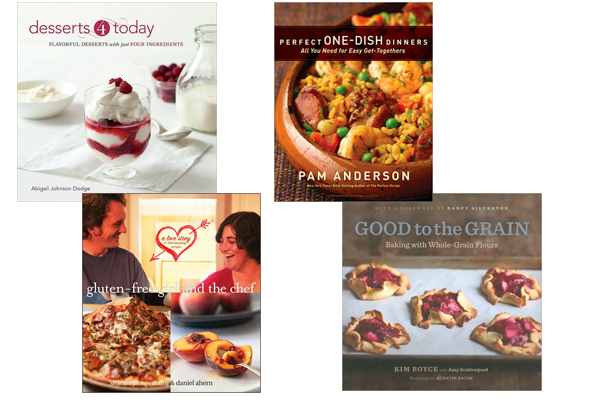 None of these authors have asked me to do this, their ‘people’ haven’t asked me to promote them – heck, they didn’t even know we were doing this little giveaway – we just think these are pretty swell cookbooks and want to share the love! Mmmm! Good to the Grain or Desserts 4 Today, I think. Thanks for another great giveaway! I would love any of these books – they all look so good! I would love Good to the Grain! I tweeted about this wonderful give-away on Twitter. Thank you so much for doing this. I would really get good use out of Pam Anderson’s Perfect One-Dish Dinners. I would LOVE a copy of the One Dish Dinners! Lovely books. Since I’ve been gluten-free for 4+ years now the Gluten-Free Girl & The Chef is right up my alley. I have tweeted and facebooked this as well. I broke my “no logging onto FB at the office” rule in order to recommend this! What a great giveaway!! I guess my first choice would be the Gluten cookbook, although I’d love any of them!! Thanks so much!! But really?! Any ONE of these shall do! Desserts for Today – YUM! Gluten Free Girl and the chef. I have 5+ family members with celiac and 4+ friends. It would be nice to be able to cook something that they can eat once in a while. Good to the Grain looks like a cookbook that I will LOVE! I’m adding it to my wish list! Thank you for a really awesome giveaway! I’d like to win Desserts 4 Today. Uncomplicated and sweet? You have me! I love Pam Anderson and the idea of dinner in one pot! Thanks for the chance to win! I love a good contest, a roll of the dice, a one in a million chance, a game. Please can I win just this time? Please?